After the roller coaster that was the end of 2009, Gemeinhardt is back on firm ground. We are emphasizing the Gemeinhardt name and getting away from Gemstone which only served to confuse people. We are Gemeinhardt LLC, selling Gemeinhardt woodwinds and W. Nirschl Brass. We continue as the distributor of Weril and P. Weingrill brass. Our booth at NAMM (National Association of Music Merchants) was always packed. The brass was extremely popular. Word has spread about the J-700 tuba. The 3/4 French horn continues to be a hit. And I continue to be delighted with the reaction to the H-700, H-879 and H-880 trombones. When I talk about the Dual-Use capability I see expressions of skepticism, then shock, because it really works. (The patent is complete.) See pictures from NAMM at the link to the right. Next show: Capitol Tuba Conference at Ft Meyer in DC Jan 27-30. 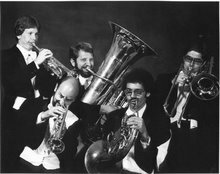 I should have the J-880 CC tuba. I am told it is on the way. Then I will be traveling to Texas for TMEA and a few tuba visits the week after. We now have 3 great tubas, The J-700 BBb, the J-880 CC and the TU2 Rotor BBb as well as a slew of Euphoniums.